Before making Jurassic World, Colin Trevorrow had only directed just one film - an indie flick titled “Safety Not Guaranteed” that released in 2012 and was screened at the Sundance Film festival. Other than that he has one TV film, one documentary and one short. So for him to take on a mammoth sized franchise and to do it well must have been a major undertaking. Jurassic World opened to a record breaking weekend raking in over five hundred million dollars worldwide making it the biggest box office opening for any film ever made. But is it any good? I went with my movie chums on a Thursday evening screening and the theater was about half full and there were a number of smaller children there. When the film ended, nobody to my knowledge had walked out and, for the first time this year, people applauded. The general consensus was the this outing was pretty darn good. Unfortunately, these films have lost their “awe factor” and become more of a creature feature, than anything. This outing though, is undeniably fun, if nothing else. The film opens with the new park open to the public. It apparently treats 20,000 visitors to petting the docile dinosaurs, safari to see more dinosaurs, and an aquatic beast that would give Shamu a run for its money. All is well and good, until the Indominus Rex (A genetic creation of all kinds of dinosaurs) gets loose and goes on a tear through the park. Other less than hospitable creatures are cut loose, as well, so you can only imagine the kind of mayhem that ensues. Chris Pratt is a young man named Owen who is ex Navy. He has been brought in to train the Velociraptors not to be so mean. Call Owen the Doctor Doolittle of Cretaceous Period. Complete with a clicker you might use to train a dog, he has been able to train all four of them to not eat everyone they come across. Well, almost. The scenes with Owen and the clicker made me chuckle. Velociraptors have the brain the size of a walnut, if I am not mistaken, and, shall we say, don’t have the mental capacity to be trained to do much of anything. When the Indominus Rex gets loose you have your movie. Some of the concepts of Jurassic World are completely silly. I mean, how many times are they going to keep trying to get the park open without someone getting gobbled up. What insurance company would underwrite this park, knowing its track record? Who would want to go to a park where you might be eaten by the amusements, themselves? Director Trevorrow and fellow writers Rick Jaffa, Amanda Silver and Derek Connolly touch on this but it is brief. There is still the ‘military’ concept of using the dinosaurs as the new weapons argued by Hoskins (Vincent D’Onofrio). There is the new financier, Simon Masrani (well played with humor and class by Irrfan Khan) who is also a new helicopter pilot. There is the bean counter, Claire (Bryce Dallas Howard), the nerd, Lowery (Jake Johnson) and the two kids that get lost at the worst possible time, Gray (Ty Simpkins) and Zach (Nick Robinson). The two boys just happen to be the cousins of Claire who have come to visit while the parents work out their divorce. Let us not forget Dr. Henry Wu (B.D. Wong) who is the creator of the dinosaurs, as he is the lead geneticist. All of the staples of the Jurassic franchise are here. The big dinosaurs that prey on the smaller ones, the visitors and destroy everything in their paths. The film is sprinkled with humor and loaded with action. The acting is good and the characters are at least interesting, even though we have seen this all before. The script (written by two of the writers for the new Planet of The Apes films) does a nice job of balancing the science with the human elements of the story. I invested in these people and cared what happened to them and Michael Giacchino’s rousing score (with John Williams Jurassic Theme music) is a pleasant treat. Pratt and Howard have chemistry and I could see them as a couple, since it is referenced their characters did go on a date with one another. “What kind of a girl brings a printed itinerary for a date?” Owen asks. “What kind of man wears shorts on a first date?” is Claire’s response. “Hey, it’s hot down here,” Owen shoots back. It has a number of scenes like this and they work. There are also number of references to the original park and some of their equipment, as well as John Hammond (Sir Richard Attenborough RIP) which are all welcome. Jurassic World is not as good as its predecessors and there is a lot to pick apart in this film. But, I had fun. It was exciting and I have to say entertaining. 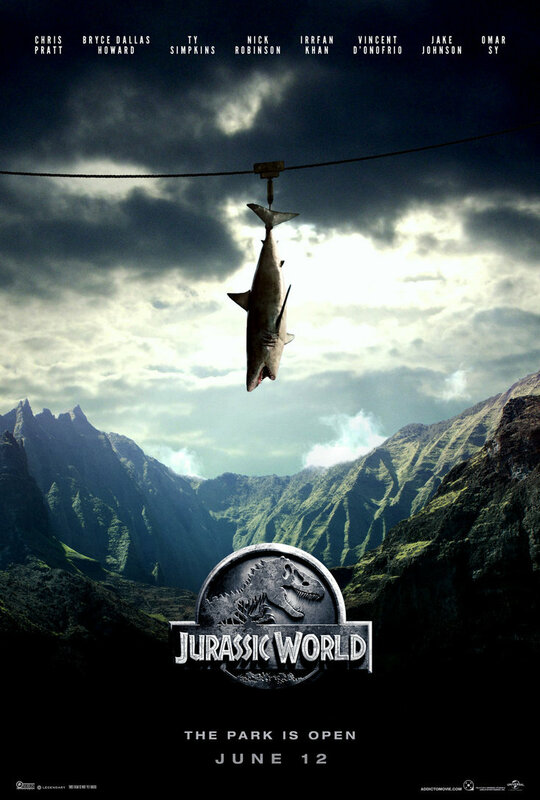 I did not care about the gaping holes in the dinosaurs authenticity or the cheese of some of the material in this film. Jurassic World is a solid thriller and it delivers the goods.